Why is our grass is always greener? The question that we are asking today is “are you proud of the way your garden looks?” If you feel that there is room for improvement, why not look at installing some of our stunning artificial grass. So, why is our Why is our grass is always greener? When it comes to looking out of your window no one wants to be faced with a dull, lifeless garden. At one time or another, that little space outside your house would have been your pride and joy, so what has happened? With just enough of the summer left for us to enjoy the great outdoors, perhaps it is time to take some immediate action. Give your garden the new lease of life it deserves and install some of our artificial grass. 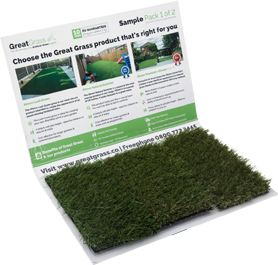 The artificial grass products that we have on offer here at Great Grass will go a long way to enhance your garden, guarantying that it remains green and vibrant all year around, even in the cold of the winter! Like the sounds of a lawn that delivers all year around? Then our artificial grass is for you. Visit us online to browse through the full range of products that we have on offer, or alternatively, give us a call on 0161 685 0071 today.